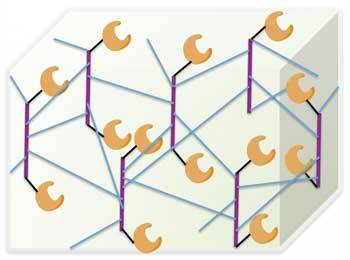 (Nanowerk News) DNA evolved to store genetic information, but in principle this special, chain-like molecule can also be adapted to make new materials. Chemists at The Scripps Research Institute (TSRI) have now published an important demonstration of this repurposing of DNA to create new substances with possible medical applications. TSRI's Floyd Romesberg and Tingjian Chen, in a study published online in the chemistry journal Angewandte Chemie ("Enzymatic synthesis, amplification, and application of DNA with a functionalized backbone"), showed that they could make several potentially valuable chemical modifications to DNA nucleotides and produce useful quantities of the modified DNA. The chemists demonstrated their new approach by making a DNA-based, water-absorbing hydrogel that ultimately may have multiple medical and scientific uses. Romesberg's laboratory over the past decade has helped pioneer methods for making modified DNA, with the ultimate goal of developing valuable new medicines, probes and materials -- even artificial life forms. The team reached an important milestone last year with a feat reported in Nature Chemistry: the development of an artificial DNA polymerase enzyme that can make copies of modified DNA, much as normal DNA polymerases replicate normal DNA. The DNA modifications tested in that study involved only the attachment of fluorine (F) or methoxy (O-CH3) moieties to the sugar backbone of DNA nucleotides -- modifications that in principle would improve the properties of DNA-based drugs. In the new study, Chen and Romesberg demonstrated several other modifications that their polymerase SFM4-3 can replicate and, in so doing, opened the door to the design of modified DNA for a much broader range of applications. The scientists in a more advanced demonstration used click chemistry to fasten multiple DNA strands to a central, azido-modified DNA strand, creating a "bottle brush" structure. They then used the assembly to amplify DNA via PCR to obtain a large mesh of DNA that--to their surprise -- formed a hydrogel when exposed to water.